Dwayne Harris ignited a spark last Christmas Eve during a game that possibly was the Raiders’ last in Oakland and perhaps the final home game of Harris’ team tenure. Turns out, it was neither. 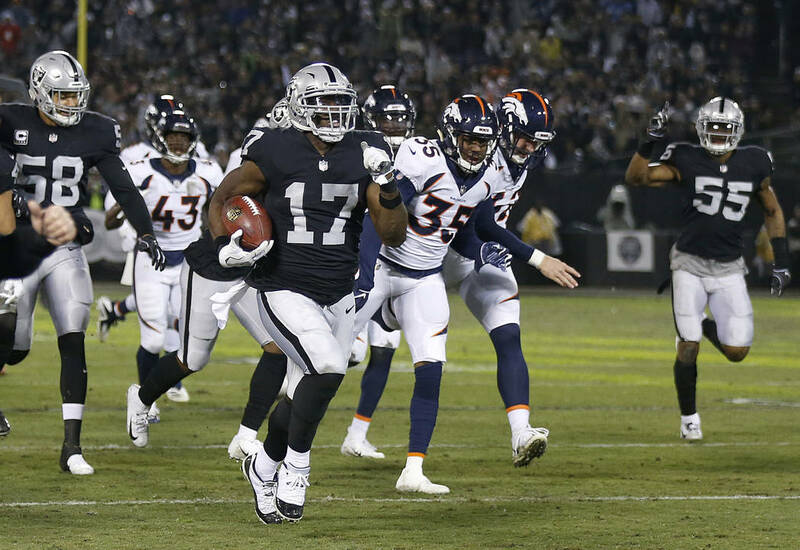 OAKLAND, Calif. — Dwayne Harris created a spark Christmas Eve during a game that possibly was the Raiders’ last in Oakland and perhaps the final home game of Harris’ team tenure. Three days after the Coliseum Authority approved a lease permitting the Raiders to stay in Oakland at least one more season, Harris signed a one-year, $2 million contract. The wide receiver’s re-signing Monday provides a boost to special teams coordinator Rich Bisaccia’s coverage and return units in 2019. On Dec. 24, in a “Monday Night Football” home finale, Harris scooped a ball that the Denver Broncos punt team seemed to down at the 1-yard line. According to a fairly obscure NFL rule, a player on the punt return unit can touch the football without risk of fumble after the punt team touches it. Harris, who turns 32 in September, waited years for this chance. He sprinted to the 1-yard line, picked up the football, turned upfield past unsuspecting Broncos players and returned the punt for a 99-yard score. It was the Raiders’ first punt return for a touchdown since 2008, keying a 27-14 win. This touchdown was one of many Harris highlights. He finished second in the NFL with 15 special-teams tackles. His rule-book knowledge also proved useful on Dec. 2. He allowed a Kansas City Chiefs kickoff to bounce toward the end zone, hoping it’d land out of bounds. It didn’t. As the coverage team approached, Harris stepped out of bounds and touched the ball. Because the ball was first touched out of bounds, the kickoff was illegal. The Raiders thus took possession at their own 40-yard line. Harris made that play in Oakland, too. Like the Raiders, he’ll return there. The team’s lease agreement is expected to gain final public approval this week when the Oakland City Council and Alameda County Board of Supervisors are scheduled to vote on the deal. It stipulates the Raiders will pay $7.5 million rent in 2019 — a $4 million increase from last year — with a $10.5 million option for 2020.